Rangers say they need to raise £30m by 2017, including a new share issue, in order to compete in Scottish football. Staff redundancies are also expected to be announced by the Ibrox club who, in a newly published review, said Rangers' financial position was "precarious". The Scottish League One champions warn they will be "unable to trade in the short term" if there is "a substantial decrease in season ticket income". Rangers have extended the deadline for season ticket sales until 16 May. Chief executive Graham Wallace's 120-day business review sets out the club's intention to raise fresh equity in the autumn, win promotion from the Championship to the Premiership at the first attempt next season, before adding a Scottish title and being competitive in Europe by 2017. The club's interim accounts revealed losses of £3.5m for the six months to 31 December and "going concern" status was only granted on the basis of predicted rises in season-ticket prices and sales. The board have had to seek emergency funding in recent months. Former Ibrox director Dave King has urged fans not to buy season tickets and, along with former Rangers captain Richard Gough, has pledged to act as a custodian to a bank account set up for fans to pay their season ticket cash into. King's hope is that this will force the board to give supporters security over Ibrox Stadium and the Murray Park training facility. In a statement released to the stock exchange, Rangers admitted the £70.7m raised though season ticket sales, commercial revenues and a 2012 share issue had been spent "relatively quickly, and in some areas liberally". "The board considers that the perfect opportunity to rebuild Rangers immediately post administration in a progressive, stable manner with a solid financial base has been completely missed," the statement continued. "Annualised savings in operating costs of £2m have already been achieved with more savings identified and in progress. These savings have not reduced the available budget for the playing squad. "Continued negative external comment and campaigns have created significant operating difficulties and have been threatening the club's orderly and progressive recovery." Though season ticket renewals are crucial to Rangers' financial position, the facility for fans to pay for them with credit or debit cards has been removed and supporters are instead being asked to pay the club directly. Rangers say this has come as a consequence of the merchant acquirer's stance that it would need "extensive security" over property assets. One caveat to the new payment arrangement will be that customers' money will not be protected in the event of the business going bust. "The board believes that one of the major factors influencing the merchant acquirer to change its terms was the extensive negative coverage of calls in some quarters for supporters to refrain or delay purchasing season tickets," Rangers explained. 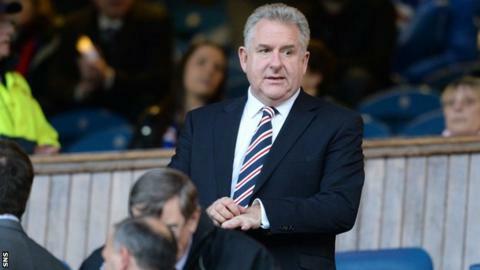 "As previously stated, the board has no intention of granting security over Ibrox. "Any supporters who are on the automatic renewal scheme will not have their tickets renewed automatically and will also require to renew their seats individually." The Union of Fans - a collective of Rangers supporters groups - said they were "dismayed and hugely disappointed with the content of Graham Wallace's review". The group added that they would not be adding further comment until next week out of respect for former Rangers player Sandy Jardine, who died on Thursday evening.